A Google Music is part of Google Project which provide management (and storage) for personal music/video collection which can be easily accessed/syncronized through any device using internet connection. You can upload your personal music collection to listen anywhere, keep everything in sync, and forget the hassle of cables and files. Google Music still on Beta version, to start using this service, you must be invited (just like other google project application) and upload music/video to the Google Music then you can start to listen everywhere. To get your device sync to google music you must installed Google Music Manager in your device, now google music manager has available in many platform such Windows, Android, and ofcourse Linux (Ubuntu), click link below to install / Download Google Music Manager for Ubuntu. 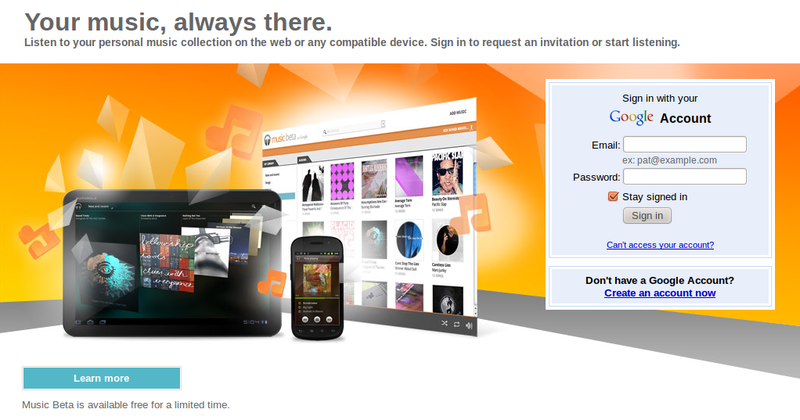 Till now the Google Music Beta is only available for US users, requesting an invite form your Google account via a US proxy could ‘gets you in’. a US proxy list can be find in here or Google Search by keyword "us proxy list". You only need to use the proxy to request the invite; all other steps, such as using the service, work wherever you are.